In 1994, founding partners of Stewart-Peterson, our parent company, were specializing in providing agricultural marketing services for farmers and ranchers throughout the country. With an interest in agriculture education, they purchased the rights to a series of agriculture lessons from AgriData Resources. Along with the acquisition of the lesson material, they hired Royal Fraedrich as the senior editor to update and publish AgEd Network materials. Fraedrich had a farm background, had been a vocational agriculture student and an FFA member, had a degree in agriculture and came with nearly 30 years experience as an agricultural editor of national farm publications. For two years, Royal worked full-time updating lessons, writing new lessons and restarting daily AgEd Today news reports for subscribers. The first version of AgEd Network was transmitted using DTN satellites along with weather and market information from other sources. Within several years, AgEd Network established a web presence and began sending lesson updates out to subscribers on 3 1/2" floppy diskettes. News reports were gleaned from Extension news releases and other sources. Lessons were in plain text format without any extras. A look at the Internet Archive Wayback Machine from June 22, 2000, shows our new name of AgEdNet.com with 14 lesson libraries and over 800 lessons, all posted online. Lessons included student text, internet references, teacher's guide, exercises and an assessment. In 2001, AgEdNet.com began purchasing the rights to use stories from the Associated Press agriculture news feed. These stores are now available in addition to news releases from government agencies, Extension and other sources. 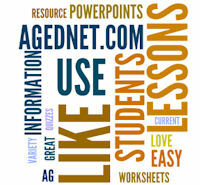 Many more lessons on a variety of topics have been added to the AgEdNet.com curriculum service. The lesson count in 2014, our 20th anniversary, was nearly 1,300. New libraries added since the 2000 Wayback Machine snapshot include Aquaculture, Crop Science, FFA & Leadership, Organic, Poultry Science and Vet Science. In addition, lesson materials now include lesson extras like 671 PowerPoints, 887 interactive vocabulary puzzles, worksheets, glossaries and a search feature. LEARN MORE. After more than 20 years, AgEdNet.com still adds up to great value for quality agriculture curriculum. We are proud to reach this milestone in our partnership with agriculture educators and students. Thank you for your support!